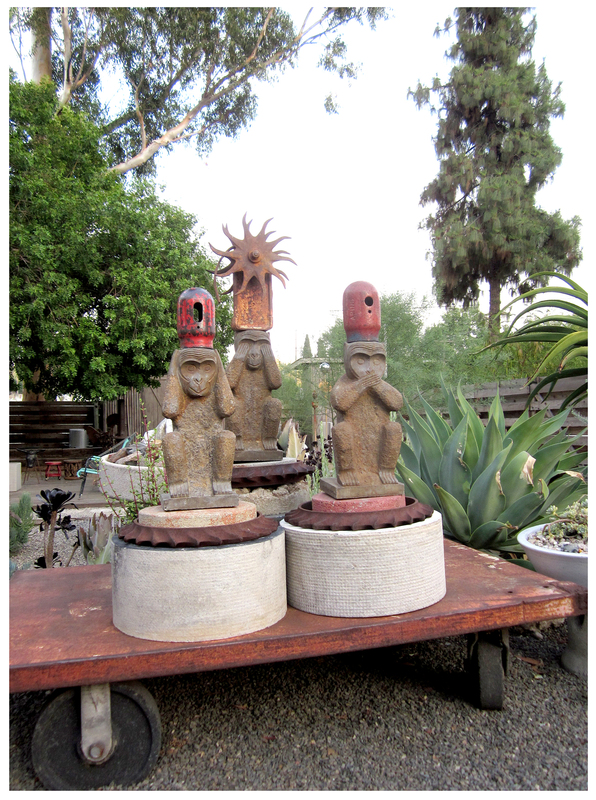 This month’s visit to the Long Beach flea market was not fun … except for hanging out with friends, running into Denise from A Growing Obsession blog, and the above, the booty: Three carved soapstone monkeys, two propane tank covers and a sun-shaped plow thing. While deciding how to photograph these new, disparate things, I arrived at this very natural-feeling arrangement. The tank covers fit just right on the left and right monkey’s heads, like fancy red palace guard hats … and the sun shape looked positively regal on the central monkey’s head. I have to admit I bought these items not knowing where, or how, I might use them in the garden … but now I had an idea. 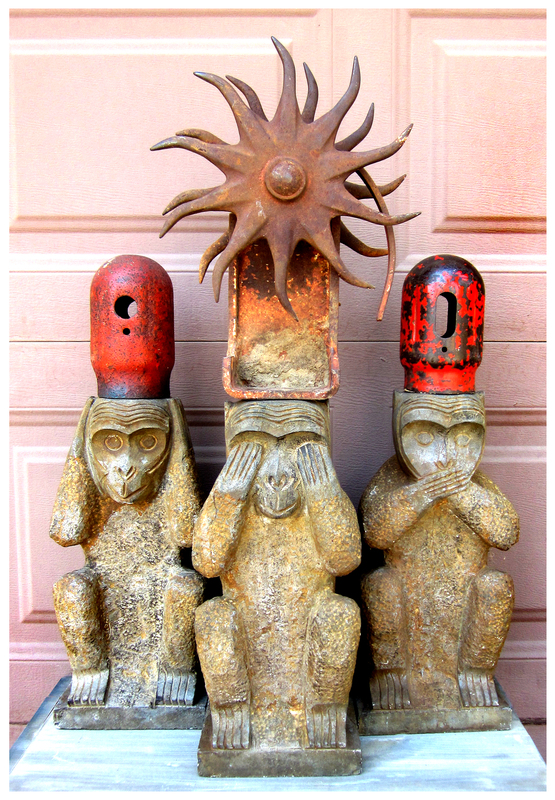 I’d make this savvy simian trio the garden’s central focal point! All-in-all I’m very pleased with my new garden group. It’s interesting — a little silly — but also well-balanced and proportionately correct. 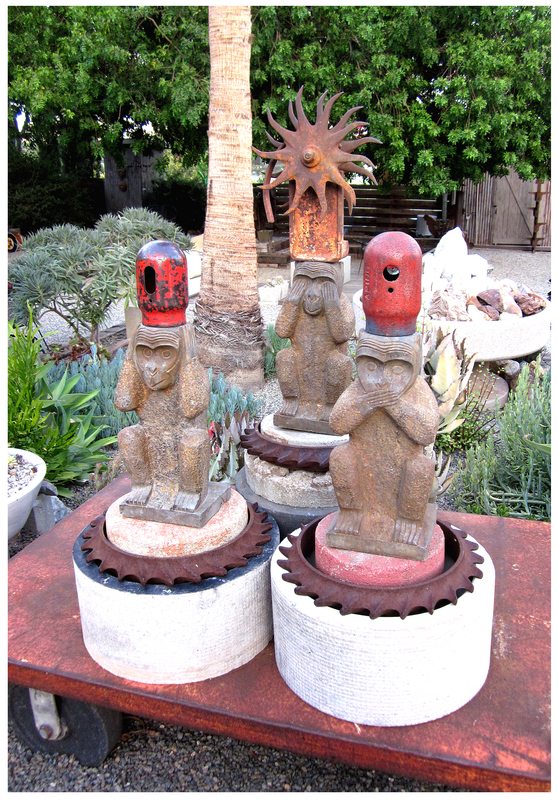 It’s checking off all the Rancho design boxes and is junky, industrial, rustic and fun. Best part: when I showed it to Paul the first time, he laughed out loud. It was a great reaction and, for me, the perfect compliment! I totally agree with Paul’s laughter! I love how they go together. I’m sorry the trip to Vet’s was so uncomfortable. Nothing worse to be at a swap meet when it’s so hot. To have a hang over also!!! Oh No!! I LOVE YOUR MONKEYS. That’s all. Better than good. Totally worth getting hangover sunstroke. Those are the coolest no-evil monkeys I’ve ever seen! I’ve got the Duquette More is More but that new tome looks pretty comprehensive. Amazing how those monkeys animate what had been a purely geometric study before. How do they manage to look both regal and fun? I think you knocked it outta the park with these. Well worth that muggy flea mkt trip. Thanks, Denise … I forgot to add I almost reactivated my double hernia lifting them into the car in the heat, too! … the things I do for junk. This Duquette book has some amazing archival pictures I’d not seen before, along with personal photos… altogether, an investment. Love your new monkeys AND WHAT YOU DID WITH THEM! Love the monkeys, and what you did with them. You are AMAZING! Just perfect. You have a real gift for putting things together!